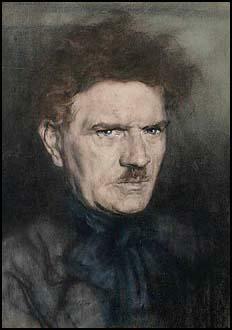 Austin Osman Spare, the fourth of the five children of Philip Newton Spare (1857–1928), a policeman, and his wife, Eliza Ann Osman (1860–1939), was born London on the 30th December, 1886. He left his elementary school in Smithfield at 13 but had some formal tuition at the Lambeth School of Art and the Royal College of Art and before exhibiting at the Royal Academy at the age of sixteen. This created some interest in his work and in an interview in The Daily Chronicle he told the reporter that he was interested in inventing his own religion. Spare became a close friend of Sylvia Pankhurst. He left art college in 1905 without completing the course. The same year, now aged eighteen, published his first book, Earth: Inferno (1905). His first exhibition was at the Bruton Galleries in 1907. It was widely attacked by the critics and George Bernard Shaw suggested that "Spare's medicine is too strong for the average man". His biographer, Phil Baker, claimed that his work was influenced by that of Aubrey Beardsley and Edmund Sullivan: "He took something from both, but he struck an off-key note of the cracked, decayed, and corrupt which was all his own." In 1911 he married the theatre actress Eily Gertrude Shaw (1888–1938). Spare published The Book of Pleasure in 1913: Robert Ansell has argued: "The years between 1909 and 1913 were Spare’s golden era. He staged several West End exhibitions and enjoyed numerous commissions from private collectors and publishers. The period reached its apex in 1913 with the publication of Spare’s masterpiece, The Book of Pleasure. Inspired by his marriage to the actress Eily Gertrude Shaw in 1911 the book is now regarded as a classic in 20th century esoteric studies. Complex and obscure, Spare’s writing in The Book of Pleasure sketches out a vision of a magical process entirely devoid of ceremony and thus swept away all conventional notions of ritual praxis." Spare was opposed to the First World War but in 1917 Spare was conscripted into the Royal Army Medical Corps. Early in 1918 the government decided that a senior government figure should take over responsibility for propaganda. On 4th March Lord Beaverbrook, the owner of the Daily Express, was made Minister of Information. Under him was Charles Masterman (Director of Publications) and John Buchan (Director of Intelligence). Lord Northcliffe, the owner of both The Times and the Daily Mail, was put in charge of all propaganda directed at enemy countries. Robert Donald, editor of the Daily Chronicle, was appointed director of propaganda in neutral countries. On the announcement in February 1918, David Lloyd George was accused in the House of Commons of using this new system of getting control over all the leading figures in Fleet Street. 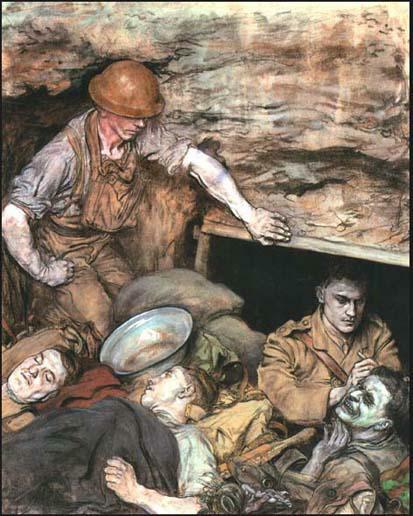 Artists sent abroad under the BWMC programme included Spare, John Singer Sargent, Augustus John, John Nash, Henry Lamb, Henry Tonks, Eric Kennington, William Orpen, Paul Nash, C. R. W. Nevinson, Colin Gill, William Roberts, Wyndham Lewis, Stanley Spencer, Philip Wilson Steer, George Clausen, Bernard Meninsky, Charles Pears, Sydney Carline, David Bomberg, Gilbert Ledward and Charles Jagger. Most of his Spare's paintings in France such as Operating in a Regimental Aid Post and First Field Dressing featured the work of the Royal Army Medical Corps. During the war his relationship with his wife, Eily Gertrude Shaw, came to an end. According to Robert Ansell "it was Spare’s satyr-like sexual reputation that probably ended the marriage: his fourth book, The Focus of Life, published in 1921, delivers a dream-like narrative and voluptuous pencil nudes – none of which were his wife. It was well received, but Spare found himself out-of-step and alienated from London’s art society and he retreated to his roots in South London." From October 1922 to July 1924 Spare edited, jointly with Clifford Bax, the quarterly, Golden Hind for the publishers, Chapman and Hall. It collapsed for lack of support, but during its brief career it reproduced impressive figure drawing and lithographs by Spare and others. In 1925 Spare, Alan Odle, John Austen, and Harry Clarke showed together at the St George's Gallery, and in 1930 at the Godfrey Philips Galleries. 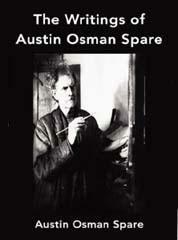 According to the author of Austin Osman Spare (2010): "Spare increasingly parted company with fame and fortune during the 1920s, and between the wars he held selling exhibitions in his council flat. He drew intense pastels of Southwark locals from life, art deco pictures of film stars from magazines, and he experimented with anamorphic distortion, which he termed siderealism." The Times reported that: "A dreamer of dreams and a seer of visions, he (Spare) had that complete other-worldliness so often depicted in romantic fiction and so rarely found in real life. Money meant nothing to him. With his talents as a figure draughtsman he might easily have commanded a four-figure income in portraiture, but he elected to live quietly and humbly, rarely going out, painting what he wished to paint, and selling his works at three or four guineas each. Even in outward aspect he conformed to type - with his untidy shock of hair, small imperial, and a scarf instead of a collar." Spare worked from a small flat in Brixton during the Second World War. In 1941 Spare was seriously injured during a bombing raid. According to one source: "For three years he struggled to regain the use of his arms until finally, in 1946, in a cramped basement in Brixton, he began to make pictures again, surrounded by stray cats. At the time he had no bed and worked in an old army shirt and tattered jacket. Yet he still charged only an average of £5 per picture." 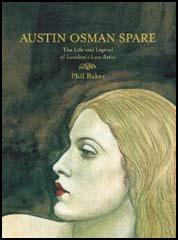 Austin Osman Spare died in South Western Hospital, Landor Road, Stockwell, on 15th May, 1956, following appendicitis. Austin Spare, an artist of unusual gifts and attainments and of an even more unusual personality, died on May 15th 1956, in hospital in London at the age of 67. A dreamer of dreams and a seer of visions, he had that complete other-worldliness so often depicted in romantic fiction and so rarely found in real life. Money meant nothing to him. With his talents as a figure draughtsman he might easily have commanded a four-figure income in portraiture, but he elected to live quietly and humbly, rarely going out, painting what he wished to paint, and selling his works at three or four guineas each. Even in outward aspect he conformed to type - with his untidy shock of hair, small imperial, and a scarf instead of a collar. But for most of his life he did not mix in what are called 'artistic circles'. Not Chelsea, Fitzroy Street, Bloomsbury or Hampstead claimed him, but for years a little fiat in the "south suburbs by the Elephant" far removed from the coteries, deep-set in the ordinary life of the people. He would teach a little from January to June, then up to the end of October, would finish various works, and from the beginning of November to Christmas would hang his products in the living-room, bedroom, and kitchen of his flat in the Borough. There he kept open house; critics and purchasers would go down, ring the bell, he admitted, and inspect the pictures, often in the company of some of the models - working women of the neighbourhood. Spare was convinced that there was a great potential demand for pictures at 2 or 3 guineas each, and condemned the practice of asking L20 for "amateurish stuff'. He worked chiefly in pastel or pencil, drawing rapidly, often taking no mon than two hours over a picture. He was especially interested in delineating the old, and had various models over 70 and one as old as 93. Spare's alleged 'automatic' and 'psychic' drawings tended to lack discipline, and were on the whole inferior to his 'straight' work. The last chiefly comprised nudes, which combined strength and delicacy of a high order and have a wonderful three-dimensional feeling. His minute draughtmaship may have owed something to the Pre-Raphaelite influence, though general his art was much more human and full blooded than that of the 'brethren'. Of his technical mastery then can be no manner of doubt. The collection of his drawings may yet become a cult.